Thought I would make a topic dedicated to stuff to inspire us to knap and good quality pictures of this stuff. 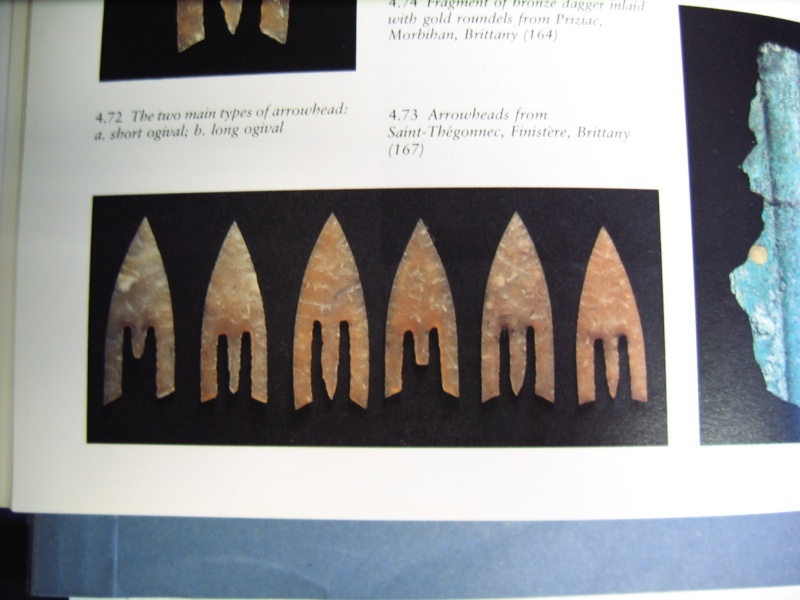 This arrowhead found in Wiltshire is arguably the finest oblique arrowhead found anywhere in the world. I had a go at making one a while back and came up with this. With my replica the stem was both shorter and a lot wider, a couple of days ago I made a second attempt. I got it to the stage of everything being finished with the stem the same length as the Wiltshire one but the width as my first attempt, I kept it thick so it wasn't so fragile while I finished of the rest of the arrowhead. Then I began thinning the stem to the width of the Wiltshire one and surprise surprise it snapped. One day I will make a third attempt. This point found in Witlshire looks a bit like an Armorican point if the tang was a bit longer. I wonder if it was imported from Armorica or local and if the knapper planned it like this or the tang broke in knapping. 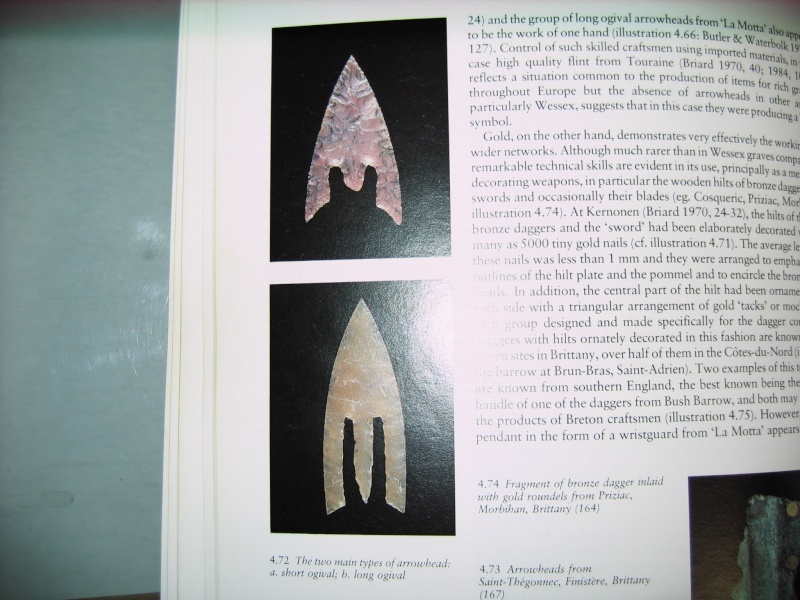 This is very much like those long ogival arrow heads from the "la Motta" burial (Brittany) I posted in notching a long time ago, sorry again for the upside down photo! Talk about drooping barbs!! wow! Yep, in theory it only takes four blade like flakes in exactly the right place to produce! These look a bit pink, maybe heat treated? 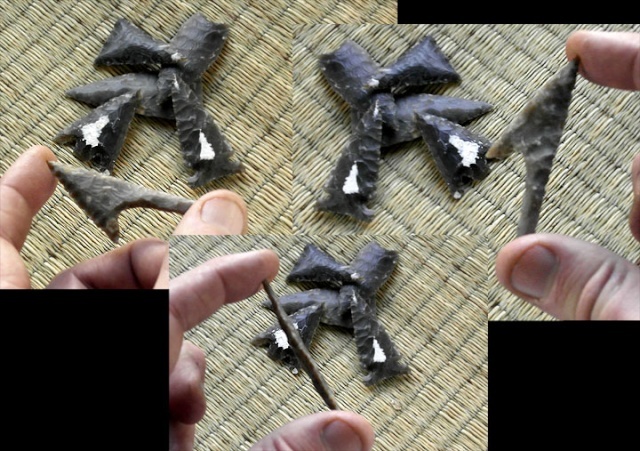 [img] [/img]Some more long ogival barbed and tanged arrowheads, these have a very thin cross section at 3mm to get the notches so long. Very delicate work indeed! 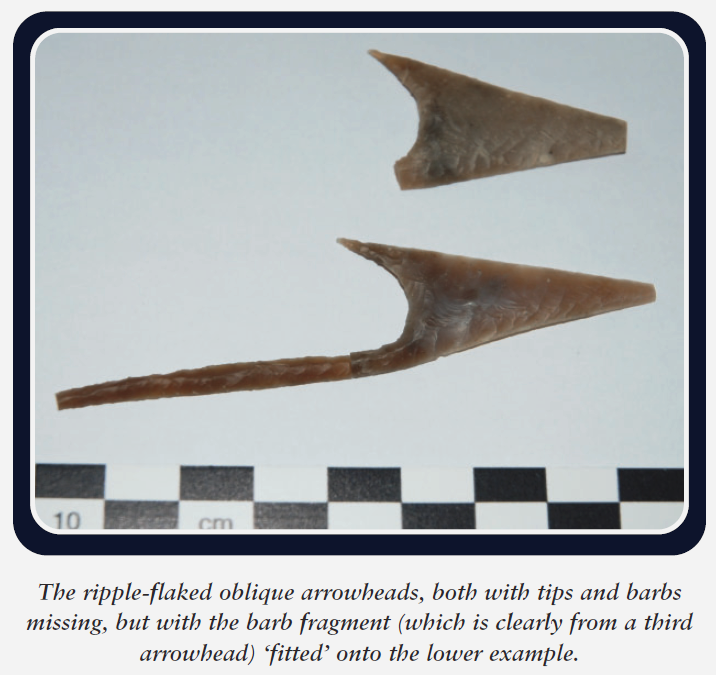 Looking at those arrowheads I'm guessing the material used was a lot softer than English flint. 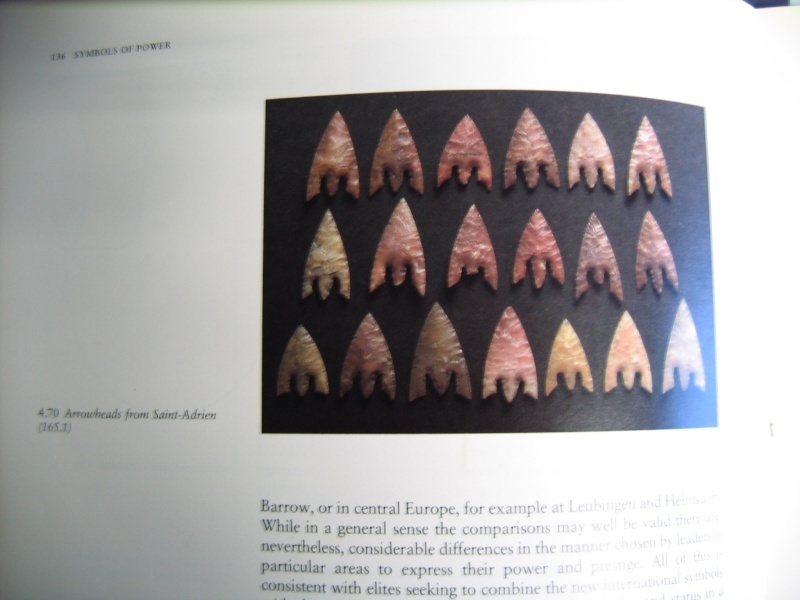 This article of Armorican arrowheads says they have never been reproduced by a modern knapper. That is fantastic! sounds like a challenge... if they are only 3mm thick then the notch needs only to be nibbled 1.5mm each side from the centre line. the depth is daunting but not impossible. A while back I found these fairly decent attempts. He looks an excellent all round knapper, shame his contact me form on the website doesn't work. Go flintknapperman! I have seen his work before and it is good, as for "slug knife" I guess it was origionally a joke name for an Early Bronze Age plano-convex knife and it stuck! 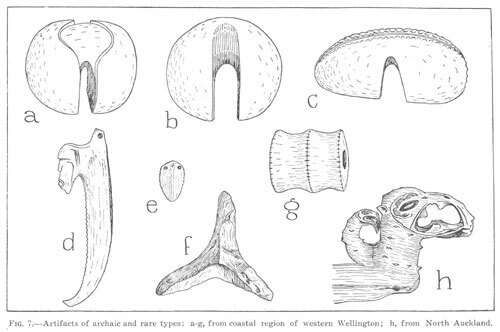 and the mystery objects look like drill bits to me, and the Amorican arrowheads are exeptional in raw flint, especially if nothed with antler. I'm tempted to try a little bonfire over some blanks buried in sand and see how far I get with the notching...hmmm. The term slug knife for planes convex knives is quite common. They aren't that difficult to make, mine was a knife gone wrong lets not waste the flint. Probably too brittle for a drill, i was going for either leather working hole punch (seems to be a flint version of a bronze awl) or just a knife gone wrong lets not waste the flint. He he, I like that! sounds very plausable. Going back to Mayan daggers, they aren't too different to the Levallois points, if they where on steroids!! They remind me a lot of aboriginal knives, though the aboriginals gave them nice painted resin handles. I had a look at the site that those knifes came from and the blades are made from quartzite! 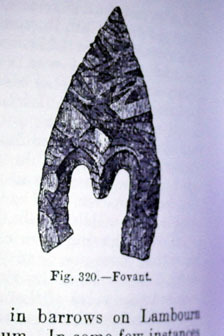 i would think to copy the Armorican arrowheads you would need to use the same flint as i am sure British flint is to hard? i have seen on american sites the flint they use seems to knap so much easier. America has a huge range of flint, and it varies greatly in toughness and the way it fractures. Some are as tough as English flint, such as the stuff from Texas, but most are much softer, some less than half as tough. This does make replicating American artefacts using English flint.... a challenge, to say the least. and Polynesia as illustrated above. Interesting all these different cultures came up with the same tool. No-one has any idea what they are for and they are pretty big up to 8 inches across. I've seen (a long time ago) really tiny examples at smaller than 1cm that where considered to be arrowheads from the sub-sahara region. These are a different beast indeed! Y shaped tools are rare in the U.K and I have handled one about 60mm long from the Cambidge area (again a while ago) from a private collection but that one could be considered more of a concave scraper with a stubby handle, more of a flake tool than a biface. 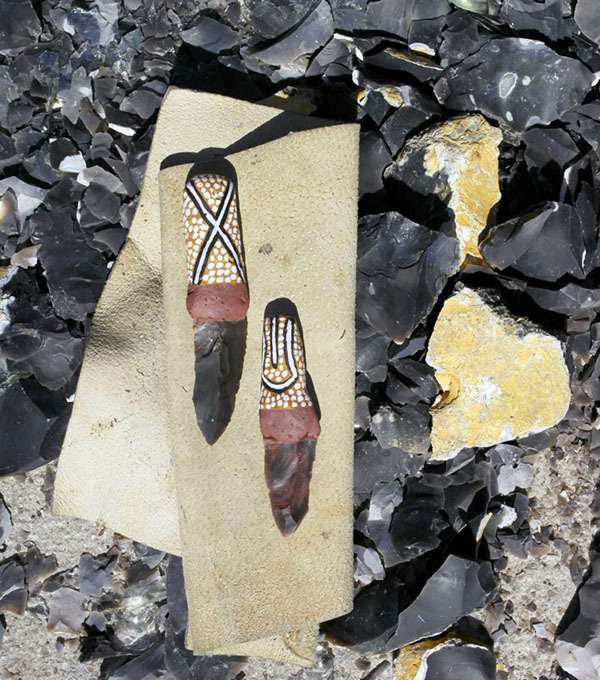 Grendel wrote: They remind me a lot of aboriginal knives, though the aboriginals gave them nice painted resin handles. My rather lame attempts, bloody difficult to make, taking a long flake from a blade core that terminates in a perfect point is no easy thing. I've actually been trying for weeks and expended half a dozen cores without getting a single viable flake, finally the last one yielded three so so ones. Then I discovered getting the resin on is no mean feat and then the painting looks easier than it is. don't think I'll be making any more. they look real smart, well made. - what resin did you use, you must have a right big pile off flint in your garden now.